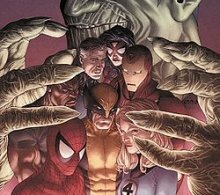 So the Secret Invasion has ended but are comic fans embracing change or readying for a Dark Reign? This week Adam, Brian, Devin, and old school favorite Flaco take to the couch and try to look ahead at Marvel’s future and give our thoughts on how they wrapped up their latest company wide status-quo changing crossover. Have a seat and join us for that and much more on this edition of the Dollar Bin.